As firstshowz had already informed you that Koratala Siva is being considered to direct Megastar Chiranjeevi's 152nd film. Now the news has been circulated about the combo of Chiranjeevi-Koratala Siva is yet to begin its shoot very soon. Koratala Siva who gave stupendous success with Bharat Ane Nenu is currently finalizing his script work and the pre-production works are undergoing. 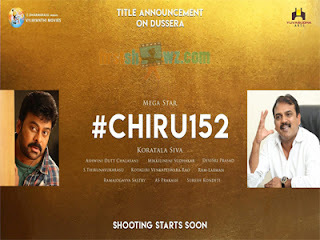 Meanwhile, an announcement on #Chiru152 film has been going viral in social media with Vyjayanthi Movies will produce this movie along with Yuvasudha Arts with Ashwini Dutt as the producer. Rockstar Devi Sri Prasad is once again roped into compose tunes to this action entertainer. However, there is no official announcement from the makers, it is worth that the film cast and crew details is expected very soon. Currently, Chiranjeevi is busy shooting for his upcoming Periodic Drama Sye Raa Narasimha Reddy in his latest schedule happening at Georgia. More details on Chiru 152 film is yet to come. The news from the close sources reveal that the film is going to be produced under Ram Charan's Konidela Productions along with Matinee Entertainments banner.